Variables are nothing but are named memory locations where data get stored. The data stored inside the variable names is known as its value. The access to these data can get by their names. Each variable has a specific type which determines its size, space and layout in the memory and the set of operations applied to that variable. 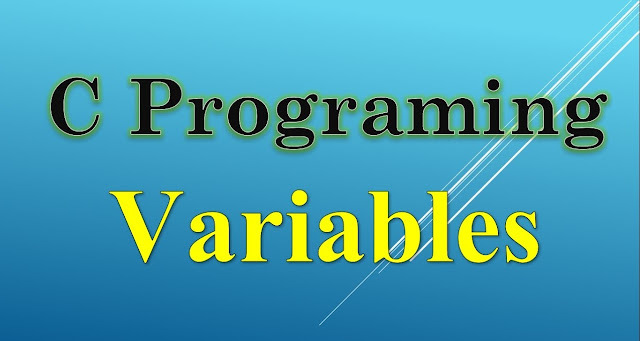 The value of the variable can be changed as per the programmer's need and can be reused multiple times in the program. ➣Variables that stores single value at a time. ➣Variables that stores multiple values of same data type. ➣Variables that stores multiple values of different data type. Variable definition tells the compiler where and how much space in the the memory can be kept for a variable. A variable definition contains the datatype and the list of one or more variables which are separated by commas. In initialization of variables the values are assigned to c variables. A variable declaration provides assurance to the compiler that there exists a variable with the given type and name so that the compiler can proceed for further compilation without requiring the complete detail about the variable. A variable definition has its meaning at the time of compilation only, the compiler needs actual variable definition at the time of linking the program. You will use the keyword "extern" to declare a variable at any place. Though you can declare a variable multiple times in your C program, it can be defined only once in a file, a function, or a block of code. ➣It's data value, stored at some location in memory. This is sometimes referred to as a variable's rvalue. 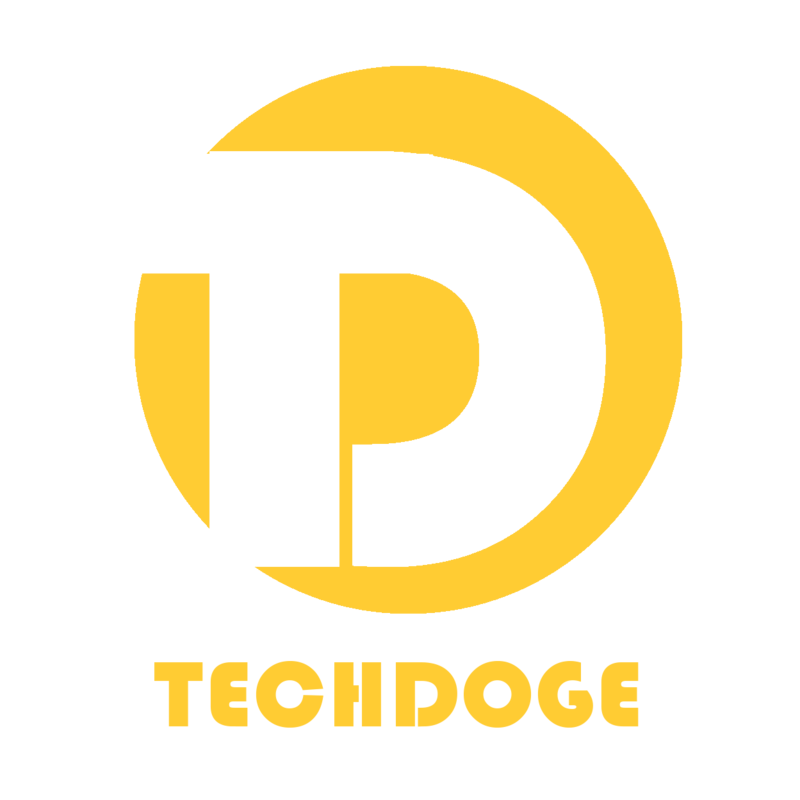 ➣Its location value,that is, the address in memory at which its data value is stored. This is sometimes referred to as variable's lvalue. 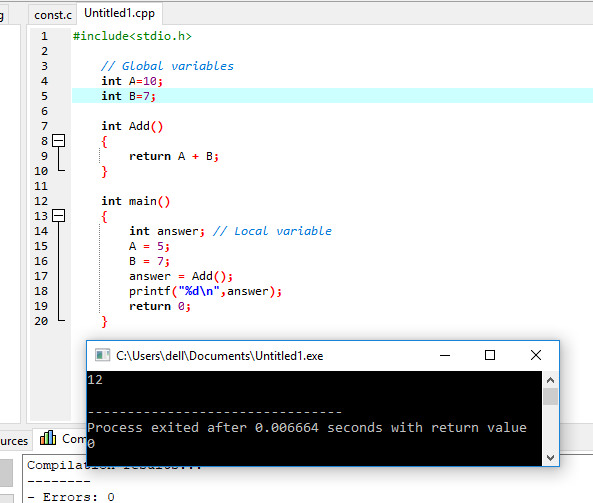 Local Variable : The variables which are declared inside a block of code or inside a function are known as local variables and are not valid outside its block in which it is declared. Global Variable : The variables which are declared outside outside every function in the program are known as global variable. Global variables can be accessed in the sub functions also. Environment Variable : Environment variable is a variable that will be available for all C applications and C programs. 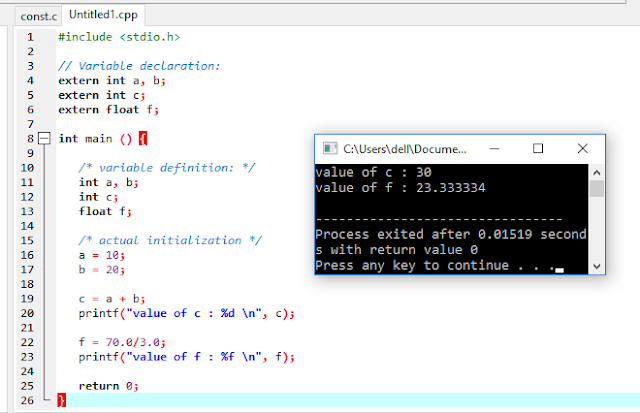 We can access these variables from anywhere in a C program without declaring and initializing in an application or C program. getenv function gets the current value of the environment variable. 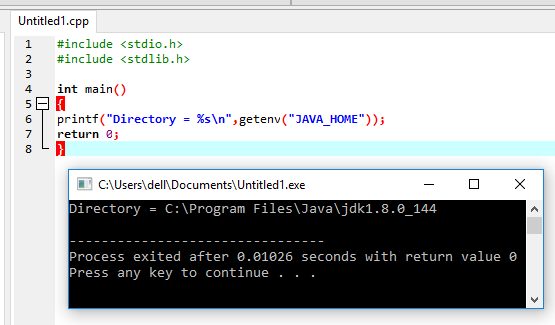 Let us assume that environment variable JAVA_HOME is assigned to “c:\Program Files\Java\jdk1.8.0_144”. Q1. What is scope of a variable? How are variables scoped in C?A1. Scope of a variable is the part of the program where the variable may directly be accessible. In C, all identifiers are lexically (or statically) scoped. See this for more details. Q2. What is lvalue and rvalue? Q3. What is the difference between actual and formal parameters?